The Salvation Army Pioneer Corps Community Center at 1920 East Allegheny Avenue (K&A) was the first Salvation Army Corps Community Center in the United States. 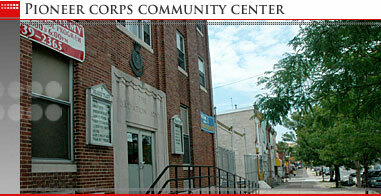 Dating back to 1879, the corps community center was originally located at 4th and Oxford streets. The neighborhood now is in the midst of a dramatic and drastic demographic shift happening alongside the challenges of drug abuse, homelessness violence, unemployment, etc. Could The Salvation Army possibly be better situated? Through our corps community center outreach programs such as The Salvation Army Pioneer School of Music, boys and girls clubs, Sunday afternoon community feeding, after-school program, social work, Sunday Morning Worship and Sunday School, we are endeavoring to build bridges to those who are recipients of our other services. This includes outdoor worship in our parking lot and mass mailings to those who received assistance at Christmas.